Principles never change – Even as I revisited this writing on the Kwanzaa principle of unity I am struck by its relevance. As I now prep for Tibiae Tech I realize that I live these principles. It is not easy.. I’m thinking of unity in personal strategy looking at personal, professional, creative and emotional or even the sectors of fashion, tech, creative, community, not separately, but together, to unify the I am that I am! I’ve decided to simplify my life and accept all that I am. The following was written on Dec 26th 2009 and published on other blogs. It was part of a series addressing culture, creativity collaboration and commerce and the adaptation, adopting and integration of new media and web 2.0! Observations are solely my own personal views and assessment and I welcome any opportunities to convince me otherwise! I have seen that word so much today that I wanted to ask them “what does “UNITY” mean, to you and how do you manifest it in your daily life!” UNITY IS A VERB … a doing word much like faith it is something that needs to be acted on! If we live the principles we extol rather than just reciting them we will neither be lost or struggling! BTW Please do not confuse sacrifice with struggle! Few realize that for the last six years I have run a totally unfunded project that helps local artist , designers and creators, The results have been great… many have been able to leave their jobs and support their families! It is up to them to acknowledge who they are, their privacy is assured! I have sacrificed for the last six years on this community project, I can honestly say I have never struggled! While I may reference their stories their names are kept private! 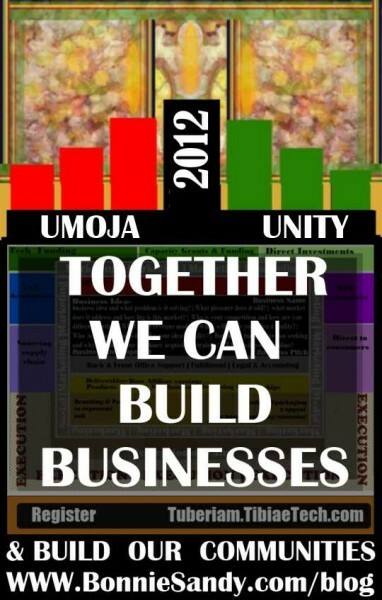 What does UMOJA mean to you; how do we go beyond saying it to achieving it! UNITY is a decision to work together to solve a need or problem that is common! More importantly it is taking steps to put that decision into ACTION! At the core, what works against us, is the notion that we can get ahead of the pack if we work alone, somehow gain some advantage and profit more than our fellow man! Essentially Unity involves working as one, putting the common goal before your own! It is an action on the part of many to create ONE! It cannot be stressed enough! Unity is about ONE common goal or purpose; it is taking responsibility. Frankly it is a matter of what we see as important! The minute we realize that survival (and working in unity as part of that survival), is the issue we will step forward! The tech industry is a prime example of unity among competitors, working to advance the common cause, yet each able to define what set them apart and stand out! I promised this series to Barbara Garnes of SoHe Designs last year. Living the principle of our culture, as a guide to succeeding in business! I will focus on how, it can be achieved rather than what is not happening. If I tell of stories, it is to show how they affect solutions. If anything reminds me of our lack of unity and our struggle to understand it… It is the demise of 4W Circle, an institution that housed many artist and was one of the few platforms for the creative in our community! There were managerial and financial problems as many arts groups face! However Unity the principle of Umoja is supposed to provide strength! So instead of rehashing what went wrong, I’ll like to tell of a model that works! I’d like to introduce you to NYC Resistor here in Brooklyn on Bridge St (they’re now on third ave)… It is a hacker space… I love it but due to my community work, I have not been able to attend the workshops etc. Simply put a group of friends needed a space to work on problems their creativity and hobbies, mainly of a tech nature but more hardware oriented, They needed tools that were expensive; laser cutters, soldering irons! So they got together created a “LEGAL” corporation and rented a space in downtown Brooklyn! They pay a monthly stipend towards expense give workshops and have a great craft night! They also host workshops and split the cost with the workshop leaders! TOTALLY SELF SUPPORTED! Out of that space has come one of the best tech innovations Makerbot Take that concept to our community, and to the fashion and creative sector! Getting folks together under a unified umbrella is difficult! In October 2003 a group of local designers met to discuss the needs of the industry… they met again a few years later and essential there has been several such meetings ! still no space. Invariably you’ll get a call when a designer, figures they need help on a project! THEY WILL ACT ONLY WHEN IT SERVES THEIR INTEREST… The problem is that their individual interest never all seem to happen at the same time! There is a need for a physical collective; with space for production, sample design and exploration with the access to the latest technology, tools and resources, not to mention a magazine and media outlets that serves the Design community! We are not speaking of what others think designers need but what designers know they need! I guess to have unity we need to have or more importantly identify a common agenda… I just assume that growth and positioning , even simple affordability in providing common needs should be enough! Last week the city closed applications for the designer incubator space! The very definitions and requirements would have kept most designers of color out! It is not till designers come to a common understanding of their needs and work together in UNITY will we see change! Working In UNITY seems simple so what’s preventing it from happening! I can’t fully agree… culturally we are familiar with “SouSou’s” Or “Hand’. This is working in unity, It has built and furnished homes ! Why can’t we put that same concept to work…a group of designers and artist come to together each putting a fixed amount, and doing their part (on time and to the best of their ability) They instead of the 3000- 5000 per month for space and marketing, a group of six would pay $500-$635. a group of ten $300-$500, They can then afford to better market as well as hire someone full time, even to get fabrications and better equipment!! They’ll each have more hours to work on their creativity! If they can get past whose name in on the banner! UNITY IS ABOUT THE BIGGER PICTURE! I’ve been having discussions with designers on this, as well as on taking in apprentices. The hold up;- Many claim frustration, people come just to “get” and then they leave! Firstly those people are going to realize they left too soon… and let’s get real that’s growth! My mother always had an apprentice and the day she had extra work or did not want to do a job she had a selection of places to send the work! I am a designer who sends people to designers all the time! I am not afraid of “Losing a Customer”, there is just so much I can handle! UNITY IS ABOUT THE COMMON GOOD! Another scenario a designer wants to save her space and asks to help, the discussion turning it into a community “coworking” design space where the cost is shared; the hold up I must control all the clients that walk through that door… this is my space! Or on the flip side artists who refuse to understand that sharing the benefits mean sharing the responsibility! UNITY can so change the landscape for businesses! Instead of thinking I gave a few dollars so I do not have to do anything but show up! Think of how much time, money and effort you saved by working in UNITY! Don’t just show up, ask what else, you can do to help UNITY is about sharing the cost and workload and effort! Or several artists wanting to vend at a street fair the space was donated by a local business the hold up! One vendor wants to charge the others full cost “EACH” for the cost of the donated space, … I need to make money, It’s my tent! In most cases unity is used as a tool only to cover cost not to gain! Unity has to have balance to work! I have heard artist say they are going to shows to get “another businesses client’s list”. they never send invites to their clients. Practice Unity. When next you sign up to an event make sure you send invites to YOUR list and add to the overall success! UNITY needs balance and needs to be fair! Then there is the other problem hustlers who see groups as a money making venture! Yes, Unity still requires work and someone has to do that work, a well organized group that serves artist and visionary endeavors is a lot of work and deserves to be supported, via direct subscriptions donations and sponsorship! We cannot let those who organize unified projects go unsupported, or we loose them! However I am speaking about those promoters, who have no idea of what they speak, refuse to do the research and get educated, and yet sell expertise and promises of large numbers; they work solely in pursuit of personal gain! Unity is about balance! I have worked on so many projects where others knew of past indiscretion, and said nothing, seeing members taken advantage of! Eventually these bad apples erode the common trust. Unity requires truth and protection and support! Too often we have and pass along only the story of struggle! Many of us are afraid to sacrifice to make choices and let go of the unnecessary weight that holds us down and back! We need to change the language we use! I was reminded of this video I discovered via a facebook link on the impact of a single story, when this week when I reconnected with a designers who had started the workshops I gave at 4W Circle Of Arts and Entertainment about a year before it closed! Her words were- can’t, fear, don’t, won’t! Those of us who are making change who have found solutions need to share! Tell the stories of victory and encourage others! There are artist and visionaries who are flourishing, finding and living their truth , passion and mission. Unity is Positive! I was recently asked why they won’t speak up and give credit or testimonials that’s part of the issue I am who I am because of those who came before me! I have mentors, teachers, even those I did not meet laid the foundation for who and what I am today! The artist I work with each taught me something new and I acknowledge that. Unity must be respectful! Posted in Latest and tagged As I See IT, Kwanzaa, Latest.